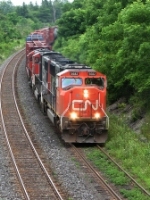 Title: CN 5682, throtles up to leave durand yard. Description: Near the White Haven Tunnel. Description: a westbound freight heads through Durand with 5 units. Description: CN train M30271 (Memphis - Baton Rouge) leaves CTC on the CN McComb sub for the CN Hammond Sub. Description: As the conductor of G004 watches on to give Q131 a roll by. Description: MNLAS 14 brings his manifest to Jerome Lane and north to the Alton and Southern Gateway Yard. Description: This will be tomorows power for 438. Title: CN 5682 at Denfield Road. Description: CN 383 gears up and heads towards the Paul M Tellier tunnel, better known as the St Clair tunnel.